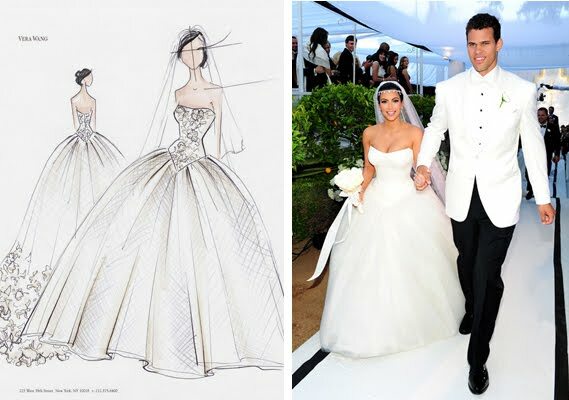 This is Kim Kardashian Wedding Dress that designed by Vera Wang, Kim Kardashian wore three different Vera Wang gowns for her Montecito wedding to Kris Humphries. Lily Aldridge look good in a strapless Vera Wang wedding dress with layers of chantilly and corded lace appliqué and raw edge swirling chiffon detail at the back. Vera Wang added an Oscar de la Renta crystal belt at the waist. Lauren Skaar, walked down the aisle in a strapless Vera Wang gown with a sweetheart neckline and bustled skirt. Michael Vartan married Lauren Skaar at the Resort at Pelican Hill in Newport Beach, California on April 2, 2011. Hilary Duff wore a strapless Vera Wang wedding dress at her Montecito wedding to Mike Comrie. Vera Wang Wedding Dresses are available at her flagship bridal salon, better bridal salons, and department stores such as Neiman Marcus, Saks Fifth Avenue, and Barney's. Check out VeraWang.com for a store locater and more information.